If you thought sewers and subways were the only things beneath your feet in Toronto, you would be sorely mistaken. The city has been home to numerous interesting (some strange) archaeological discoveries, including the remains of a giant beaver-like creature in the Don Valley and shark teeth at the foot of Yonge St.
And there are still new discoveries to be made. For example, it's thought Knapp's roller boat, a bizarre cigar-shaped vessel that promised (and failed) to eliminate seasickness and slash ocean crossing times, is embedded in ground somewhere near Sherbourne and Lake Shore. Until the next big discovery, here are 5 strange things that have already been discovered underground in Toronto. According to a report in the Globe newspaper in 1894, two shark's teeth were found deep among the soil excavated for the foundation of the Board of Trade Building at Front and Yonge. One of the pair was in the possession of B. E. Walker, president of the Bank of Commerce, the paper wrote. Twenty years later, one of the teeth (possibly the same one) was on display at the Royal Ontario Museum. "If it came here by natural agencies its presence here is a mystery yet unsolved." As noted geologist Arthur Philemon Coleman remarked in the Globe: "This is certainly a most puzzling find, for no tertiary rocks are known to exist between here and Hudson's Bay, and all the evidence is against transport of drift materials from the southward." His best explanation, beyond the whole thing being a hoax: "Some hidden outlier of tertiary rock to the north of us may have supplied these fossils." The origins of a mysterious section of whale vertebrae discovered during construction of the underground streetcar tunnel between Union and Queens Quay have never been conclusively proven. The most plausible theory is that the bone was a souvenir from the west coast that was simply discarded into the lake and covered with fill. Work by Royal Ontario Museum palaeontologist Kevin Seymour determined that the bone came from an orca. Seymour can't say how the spinal section came to be under Bay St., but the idea of whales being in Toronto isn't as wacky as it sounds. 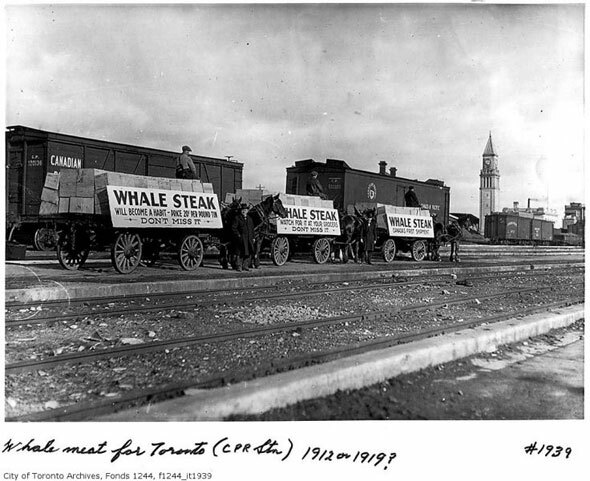 Whale meat was touted as an alternative to pork, beef, and other meat during the first world war and recipes for "Whale Steak Pie," "Whale Loaf," and "Whale Steak Croquettes," appeared in Toronto newspapers. Some of the meat was processed at the city's municipal abattoir on Niagara St., so it's possible a bone could have found its way into the bay. A devoted fan of sifting and studying Toronto soil, Arthur Philemon Coleman is responsible for another strange find, this one on the Don Valley. As Adam Bunch recalls at the Toronto Dreams Project, Coleman unearthed remains of seven-foot-long, 200-lb beavers that used to roam in this area some 130,000 years ago. The terrifying, shaggy-haired beasts probably had long fur, thin tails, seven-inch teeth, and were about the size of a black bear. The remains were found within a cliff excavated by brick workers in the Don Valley. Based on studies of other fossils in the surrounding rock, Coleman concluded that the creatures probably lived in marshland on the shores of a proto-Lake Ontario until the last Ice Age, which, sadly, killed them off entirely. During excavation ahead of construction of the Skydome in 1987, consultant John Fahee was inspecting a mound of soil near Spadina Ave. when he noticed what he thought was a section of metal piling. 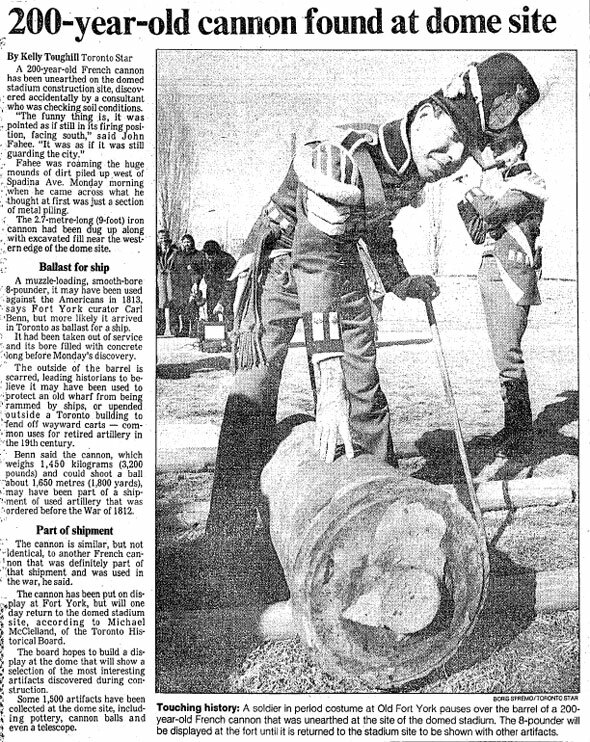 On closer inspection, the cylindrical object turned out to be a 2.7-metre French cannon. Experts believe the eight-pound, smooth-bore weapon was brought to Toronto as ballast on a ship. The inside had been filled with concrete prior to its arrival, possibly to give it additional weight, and the exterior was heavily scratched, suggesting it had also seen service as a bumper on a wharf or outside of a building. Also discovered during the Skydome dig: pottery, cannon balls, and a telescope. Today, the cannon is part of the Rogers Centre Tour Experience. To demolition workers in 1956, Taber Hill at Lawrence and Bellamy in Scarborough looked like a natural landform. It wasn't until construction crews tasked with removing it discovered human remains that its true origin was revealed. After archaeological examination, it was discovered that Taber Hill is a Iroquois First Nations burial mound, containing some 427 bodies. As part of the traditional Feast of the Dead ritual, the deceased were interred elsewhere and later gathered at Taber Hill. Happily, Taber Hill was saved from demolition and is now a recognized burial ground. Andrea Williams. Remaining photos from The Toronto Archives. Written by Chris Bateman.